ECO Advanced Level 2 subjects follow on from completion of level 1. The focus in level 2 is a more advanced applications and diagnostic level echocardiography knowledge. Basic TEE and TTE moves to advanced TEE and TTE. The course instruction builds upon previous knowledge so it is best to complete the subjects in order. For the ECO Advanced Level 2 certification, all subjects ECO 5 – 8 need to be completed and satisfactorily passed. This course is open to medical and non-medical students. A tertiary degree is a requirement, but special consideration will be made for a student nearing the end of their medical or paramedical degree studies. This online course provides a structured educational ultrasound program with self-assessments to reinforce the learning experience. Upon receipt of payment, the student will receive a “Getting Started” email with instructions on how to access the course materials. Students will be notified four weeks prior to an examination period and can nominate a subject for that period. Multiple subject examinations can be completed in the one period, as long as all self-assessments have been completed. The self-assessments and examinations are completed via a web-based system. For self-assessment questions, once completed, the screen will refresh with the answers and explanations. To see the full tutorial list please download the Course Brochure. Please see support@iteachu.com for discounts for a group purchase. The ECO Advanced subject 5 tutorials introduce building block tutorials related to safety and care of TEE probes. More advanced anatomy and Doppler application are covered, as well as a calculations workshop tutorial. Learn about advanced reporting using our reporting database for comprehensive reporting. The ECO Advanced subject 6 systematically goes through the advanced assessment of all the valves, including prothetic valve assessment. 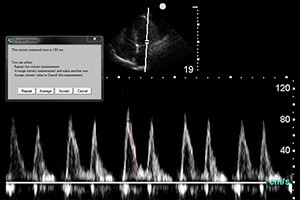 The ECO Advanced subject 7 emphasises the application of echocardiography in clinical situations. The ECO Advanced subject 8 integrates all the skills and knowledge learned. This subject offers 50 comprehensive case studies centered on five themes.